The last few weeks have seen the market’s concerns spread from Greece to Spain which has seen its sovereign debt rates rise to levels previously unseen in the time of the Euro. In an interview with EUROPP editors Chris Gilson and Julian Kirchherr, LSE economist Luis Garicano outlines what has led to Spain’s current problems and what chances it now has for recovery. The Economist has recently argued that “Greek politics may determine the euro’s short-term future, but it is Spain that poses the single currency’s most difficult problem.” What are the roots of the Spanish misery? There are two views on what’s going on in Spain, and both have a big element of truth. One is what I would call the ”macro view”, which is a variant of the general view that has been put forward to the public mainly by economists like Martin Wolf and Paul Krugman. After Spain entered the Euro there was an excessively lax monetary policy and negative interest rates for a couple of years, it was too easy to get credit. People used this easy credit to invest in real estate, and the whole economy shifted dramatically in that direction. There was a very large current account deficit that followed from the construction bubble, and thus there was a huge increase of indebtedness abroad, particularly with the Northern European countries that were recycling their excess savings in Spain. This left the economy extremely overleveraged; as families, corporations and the financial system had lent too much, and Spain suffered a variant of the typical “sudden stop“ in lending from the markets that we often see in developing countries. However, in Spain this was not sudden as the ECB replaced private lending. We have seen over the last months a huge inflow of money from the ECB – the negative balance of Spain with the ECB is €300 billion right now. That’s money that is being financed through the ECB’s long term refinancing operations and liquidity injections. It is supposed to be liquidity but they are actually financing what is left of the current account deficit, and they are also financing a large outflow of capital from Spain to the European core. Before, Northern European Banks were lending to Spain´s banks; now the ECB is lending to banks through the Spanish central bank. This view is correct, but incomplete. What it is missing is the “microeconomic“ issues, the institutions and incentives which determine the reactions by politicians to this inflow of money and to its sudden stop. It’s not a coincidence that the countries that have these problems are countries like Greece, Italy, Spain and Portugal. Greece, Spain and Portugal have democracies that are only about 40 years old. Specifically, in Spain there was a Bermuda Triangle that all this inflow of Northern Europe money fell into, formed by the regional governments, the savings banks (the now famous cajas) who doubled their share of the market since the advent of democracy and financial liberalization, and the real estate developers. From the perspective of the regional governors, the cajas were essentially regional development banks with private money, though they were officially semi-private institutions like the Landesbank in Germany. They would appoint politicians to the boards, and often, as research by LSE´s Vicente Cuñat and myself has shown, they had had CEOs with no banking experience and no education in economics or finance. As we found, precisely those cajas run by clueless CEOs had the largest amounts of real estate loans and of non-performing loans. So what you had was a system, which was confronted with a big inflow of money in the early 2000s, but did not put this money to productive uses. Now we are talking about recapitalizing Spanish banks in June 2012, five years too late, since the start of the crisis. It would have been very easy to borrow this money two to three years ago when Spain could borrow like Germany. The approximately €40-50 billion needed (by IMF estimates) is not a lot of money – it’s cheaper than the UK’s bank recapitalization. The problem is that the Governor of the Bank of Spain and the government were not able to stick their hands into this mess because the regional politicians had so much leverage over the way that these cajas were run and these were key instruments of their power. Spain had two things in its favour in the lead up to the crisis. The government had been drastically reducing the deficit, using the revenues from the real estate bubble, so at least the government was somewhat responsible, or at least knew what was coming. The Bank of Spain also didn’t allow the banks to go crazy on American and UK lending, and allowed no off-balance sheet vehicle, so we didn’t have the US’s sub-prime problems. So those two things were helpful, but they also allowed Spain to kick the can down the road, and to say “we’ll deal with it later”, and that’s part of the reason why the response has been too slow. What will the consequences be of this €100 billion bailout? 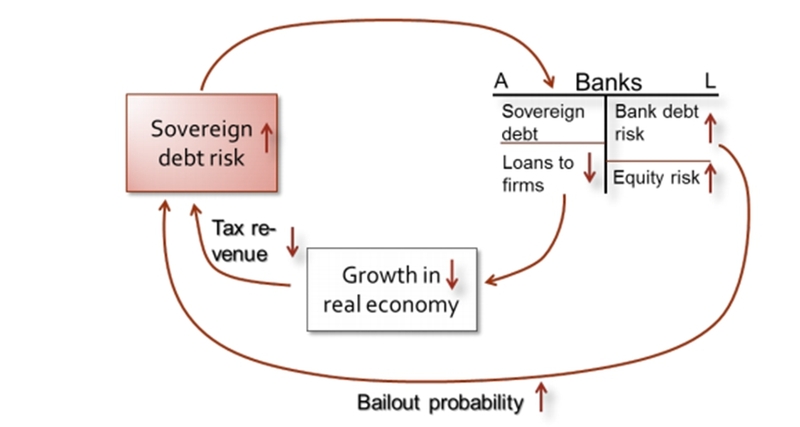 The bailout´s outcome is likely to be to draw Spain more deeply into its diabolic loop (shown in Figure 1 below); which is where sovereign debt risks are sinking the banks and the banks are sinking the sovereign debt risks as well. This rescue doesn’t break the sovereign loop. How do you break it? Think of the US – if Arizona has a housing bubble, and all its banks are in trouble, then the Federal Reserve and the US wide FDIC takes care of them. They don’t sink Arizona’s government – it’s still solvent, it’s a problem for the government. So this diabolic loop does not exist in this situation, because those who print the money and those who make the transfers for unemployment, etc., are outside of this mess. In Spain, the only back-up for the capital of the banks, not for the liquidity, is the Spanish state. And the only buyers for Spanish government bonds today are the Spanish banks. If Moody’s downgrades Spain’s debt to junk status then all these banks that have these bonds on their books can no longer go to the ECB. Forcing the Spanish state to be the banks’ rescuer means that the Spanish state is even more involved with the Spanish banks. So we were pressing for a recapitalisation which would allow Europe to find new ways and new instruments, to take the initiative towards a banking union. Europe as a whole has an interest in the banks as whole. That’s not happened, so I am very worried about the rescue. 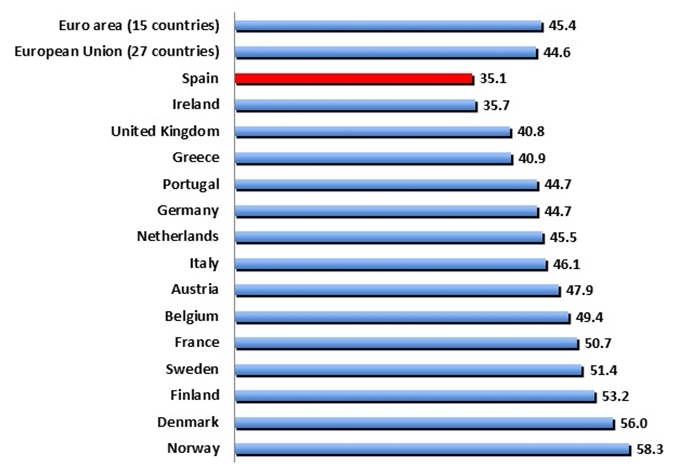 What policies now need to be adopted in Spain to help it to get out of the crisis? Right now the Spanish government is giving a very strong impression of improvisation, and changing its mind all the time. That’s a problem. The other problem is that Europe looks at Spain and accuses them of not doing their part, and Spain looks to Europe, feeling that without them it can do nothing. Europe needs to recognize that Spain is in this diabolic loop. Why have these banks not defaulted? If they did, the French and Germans would lose money. These rescues are rescues for the lenders, and in a capitalist economy, if the lenders have made a mistake, then they have to pay the private lenders, not the government. So those governments who recognise that it’s in their interest for Spain to be bailing out those banks have to take some of the risk. Will the current focus on austerity in Europe solve the continent’s crisis? No, I think austerity is misguided as a Euro-area policy. I think Spain does need to cut its structural budget deficit, so I think the two things are compatible. All those figures of 3% budget deficit reduction in two years – that’s arbitrary and absurd. Those kinds of exact measures (for example 5.4%) are completely counterproductive when the economy is contracting by more than 2%. You do need to have a scenario where you can see the stabilisation of Spain’s debt, and indeed the corresponding thing should be that the Northern countries that have the ability to borrow at zero rates should be doing that, and using that capacity to try and compensate. Austerity in the whole Eurozone is a mistake, but what people forget in this debate, is that Germany is an ageing society, very much in a demographic hole, and other European societies are ageing, and they’re scared about the future which is why they are accumulating savings. It’s very easy for all of us to tell them that they should be spending more, but their families and households are increasingly concerned about the future. Both the Greek and German electorates are sovereign, and both want different things. If you have one large federal union (like in the US), and one interest group is bigger than another, then their policies win. But the EU has separate sovereign countries that both have the right to do what they think is correct. You cannot go to the Germans and force them to spend their money if they’re worried about their demography. Where do you think the Euro will be ten years from now? I have no idea where it will be ten days from now! It’s very scary. China, India, and all of the other countries are slowing down at the same time. Sometimes you think – how will it end? I’ve always been worried that so many things have to work out well for the Euro to work. There are so many possible accidents. Imagine Greece decides to exit the Euro, for it to work out well you need 17 countries in a room over a weekend to decide to things like extending credit lines to a country that will abandon all of its obligations to them. Can these sorts of things be decided over a weekend? Luis Garicano is Professor (Chair) of Economics and Strategy, Department of Management and Department of Economics, London School of Economics. He is also Head of the Managerial Economics and Strategy Group and Director of the MSc. Economics and Management at the School, a Research Fellow at the Centre for Economic Performance (CEP), LSE and at the Center for Economic Policy Research (CEPR), as well as a researcher at the Fundación de Estudios de Economía Aplicada in Madrid. Professor Garicano received his PhD in Economics from the University of Chicago, where he was as well an Assistant, Associate and Full Professor, and a visiting Professor at MIT and LBS His research interests are productivity growth, labour economics, corporate governance and incentives, firm knowledge and capabilities, and law and economics. He is founding editor of Nada Es Gratis, the most influencial economics blog in Spanish. Other than that, a very informative interview, thank you for this.